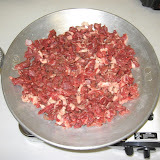 Cut up the meat finely and cook in a frypan until water avoperate. When the meat tender add salt, blackpepper and oil in and wait 2-3 more minutes on low heat. Make a soft dough with flour, water, salt, sugar and yeast. Make small balls (such as a walnut) and cover them with a wet towel. Wait 15-20 minutes and roll out the pieces as big as a dessert plate (look at the pictures below). Cook them in a frypan for about 2 minutes, until the bottom is light brown. Loosen with a spatula, turn and cook the other side. The breads are ready!